Let’s face it, he’s probably one of the few people that can afford one. The ground-breaking Bugatti Chiron promises to be one of the most exciting new cars released in years. Before deliveries for the extreme 1,500 horsepower hypercar commence early this year, Bugatti has enlisted soccer star Cristiano Ronaldo to give it an exclusive test drive. Celebrity endorsement is the oldest trick in the marketing handbook, but at least Ronaldo is clearly passionate about cars: his garage consists of several Porsches, Ferraris, BMWs, Audis and of course a Bugatti Veyron. Considering he earns over $30 million a year, he’s one of few people on the planet that can probably afford one. Bugatti wanted the Chiron to be “tested and approved by a champion” before they get sent out for delivery, and a promotional video shows Ronaldo putting a stunning silver Chiron through its paces at the Ehra-Lessien test track. His conclusion? Bugatti says the Chiron was “approved after comprehensive testing.” Of course it was, because Bugatti paid you to say that, but he seems genuinely ecstatic to be driving it. Getting the opportunity to drive a car that can do 0-250-0 mph in under a minute would put a smile on any gearhead's face. While it seems unlikely he will have taken delivery of a Chiron yet, you can bet he has one on order – the $2.61 million price tag won’t be putting much of a dent in his income. 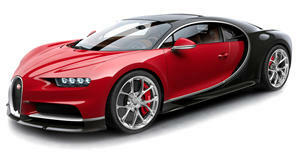 500 Bugatti Chirons will be produced in total, with 220 already allocated and 70 models planned for production this year.